"I'll never let go, Jack!" I was just 14 years old when Titanic came out. It was at this age that my crushes started turning into what I called “relationships.” I went out with a few boys for 1 week, 2 weeks, 3 weeks, and it would end. Somehow the “relationships” would end and I’d be chasing the next guy. And somewhere in that time Titanic came out. Somewhere during that time I longed for the love that I saw in the movies. I remember saying once to a friend and her man of the minute, in my teenage angst, “I can’t be around ‘happy couples,’” — my longing for a “love” of my own clouding my mind. 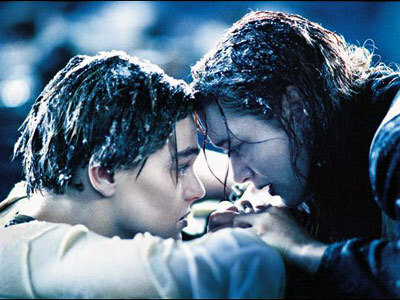 In seeing Titanic again, I am reminded of a portrayal of love that truly affected my innocent mind. Love was this passionate thing that happened so quickly, a chemistry that perhaps was scary or forbidden, a desperation to never be apart. I’d listen to cheesy love songs (ok, still do sometimes) while talking to “love interests” on the phone — and think that love was this undying thing and that the strong feelings of desire last forever. In retrospect, it would probably be exhausting and quite distracting to have those kind of emotions at the forefront all the time! What it sounds like to me, now 15 years later, is the feeling you get at the start of a relationship, the “honeymoon phase,” or during a summer fling. All you want to do is stare at the stars, look deep into each others’ eyes and hold each other. It’s the feeling you get when you are just getting to know a person, and he/she seems so perfect and there is hope that this feeling could last forever. It’s before you start falling into the routine of each other’s lives, before you begin the steps of becoming an item and becoming partners. It’s before you know each other’s habits and secrets. It’s the phase where your interest isn’t quite human just yet, but a dream covered in flesh. So now, 15 years later, I still hold on to this idea of love, but of course I know that love is much more than passion and chemistry and cheesy one liners. Love takes work to keep this feeling going. Love takes commitment and understanding, compassion and forgiveness, compromise. Love takes friendship. But I guess a 14 year old has got to learn the hard way. My 14 year old self was so naive about boys, haha. The boy I had a crush on that year was a small, terribly misbehaving, dark haired one. I think I saw him throw a desk over once and immediately fell in love with him. I later had a crush on his best friend, whom I saw cheating and fell in love with. I had a thing for the bad boys.